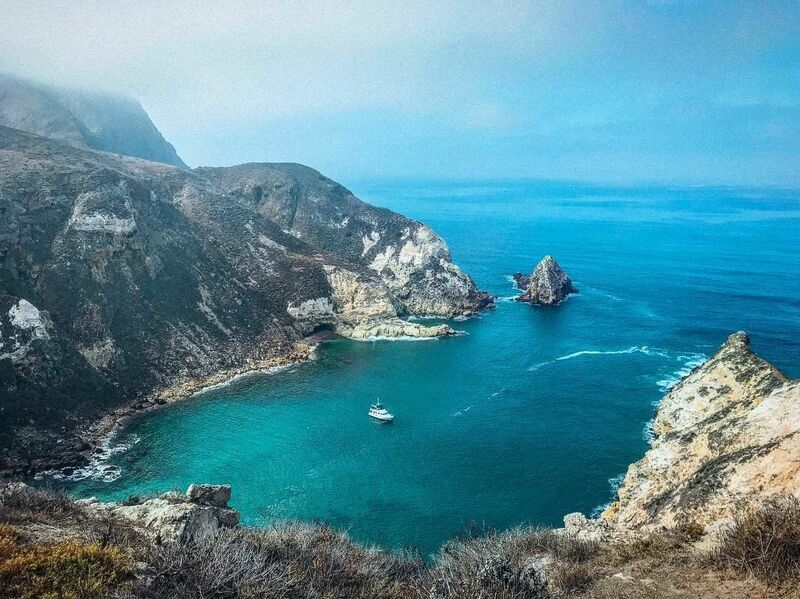 Planning a trip to Channel Islands National Park can be a daunting task since it’s not as easy as getting in your car and start driving then figuring out as you go. This park encompasses five remarkable islands – Anacapa, Santa Cruz, Santa Rosa, San Miguel, and Santa Barbara islands. The park protects their ocean environment, preserving and protecting a wealth of natural and cultural resources. 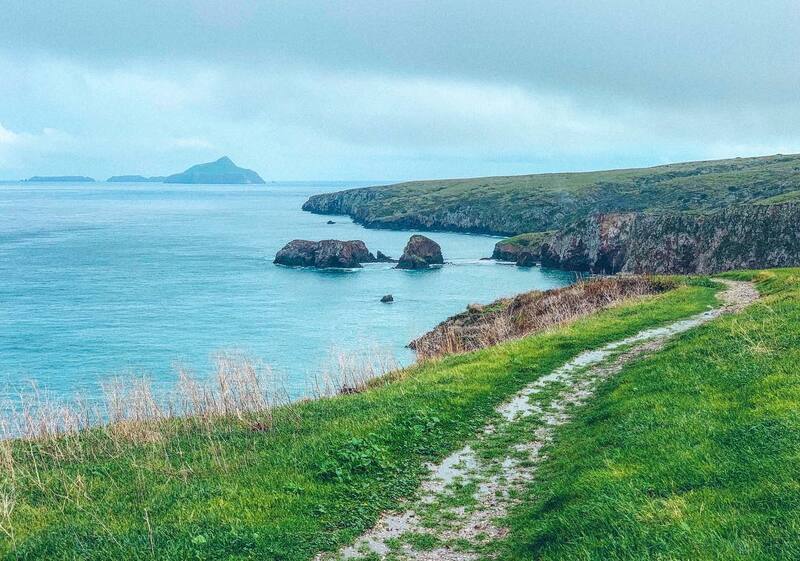 Here are 14 things not to miss on your first visit to Channel Islands National Park. The Visitor Center for Channel Islands National Park is located in Ventura, California by the harbor. 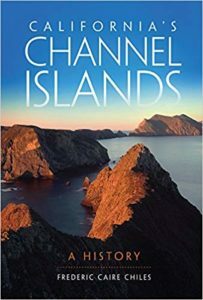 There are five islands that make up Channel Island National Park. The only way to access the islands is via ferry. There are no public piers in the park. Ferris are provided by Island Packers. The two most popular islands are Anacapa and Santa Cruz. Ferries leave from Ventura harbor and Oxnard harbor. Santa Barabra Island – Currently not offered due to damage to the pier. Day trips are only feasible for Anacapa and Santa Cruz. The ferry ride is between 1-1.5 hours long. The other islands can take upwards of 2 to 3 hours. 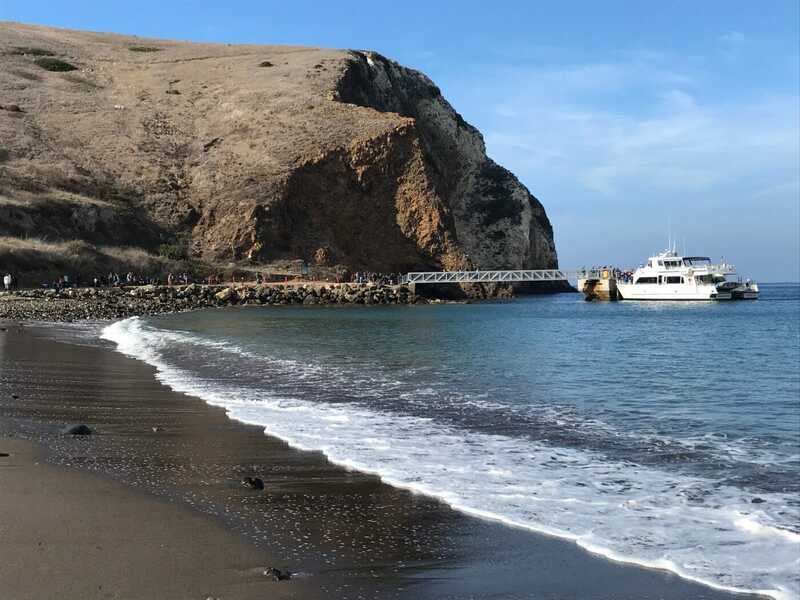 During the winter and whale watching season, Anacapa Island ferry landings are limited and it may be a cliff landing rather than a beach landing. 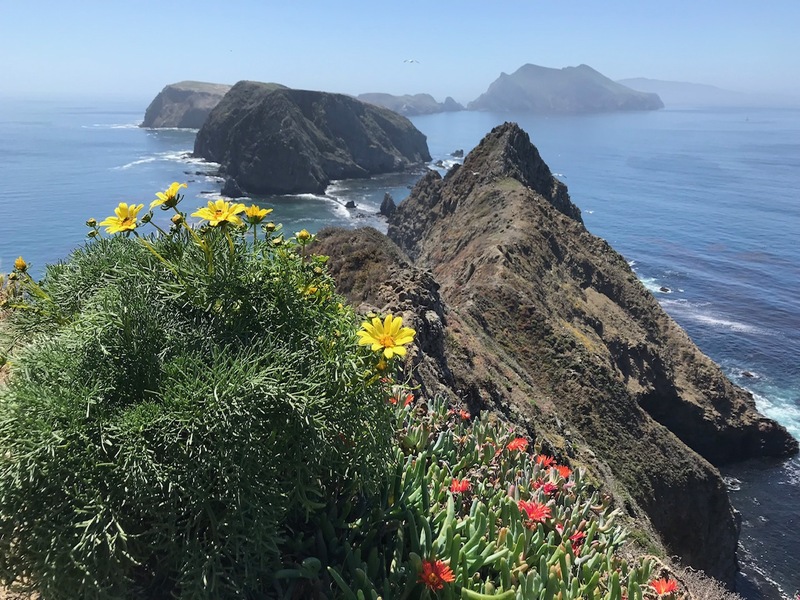 Another season to consider is the bird season in Anacapa Island. Seabirds are probably the most conspicuous wildlife here. 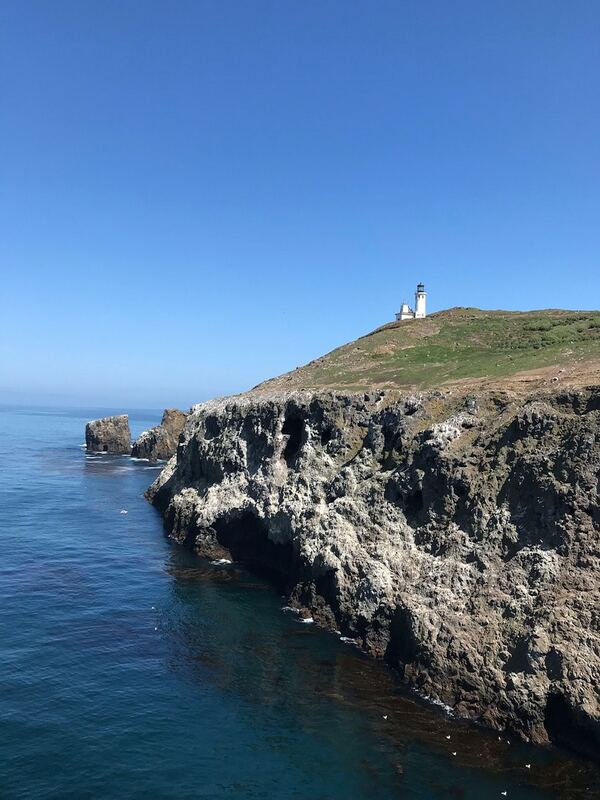 Thousands of birds use Anacapa as a nesting area because of the relative lack of predators on the island. 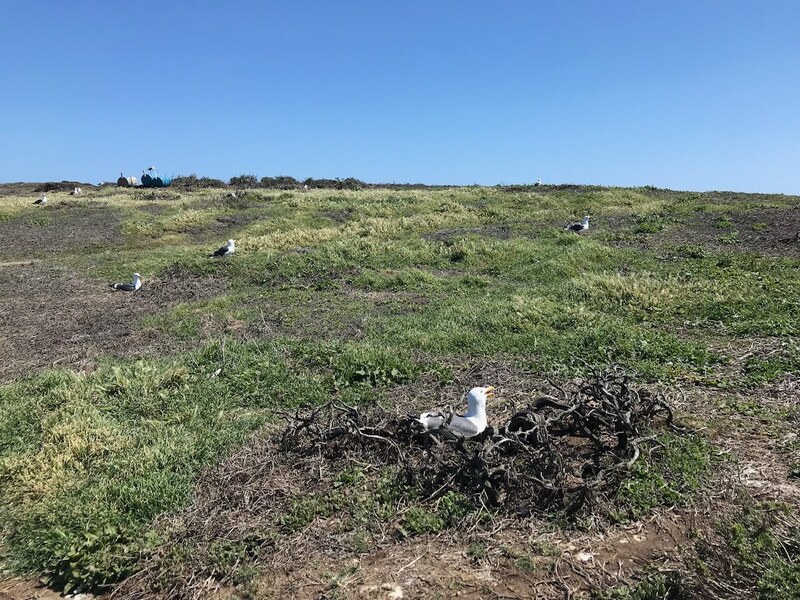 Western gulls begin their nesting efforts at the end of April, sometimes making their shallow nests just inches from island trails. Fluffy chicks hatch in May and June and fly away from the nest in July. Yes, it does get really loud out there during this peak bird season! Camping is limited to the designated campgrounds. If camping on the island, make your ferry reservations FIRST then book your campsite. Campsites must be reserved before your arrival. There is NOT first-come first-serve camping. There are no services on the islands. Please pack accordingly. Bring all food, snacks, sunscreen, and water with you. Save the park money and protect the wildlife by packing out all trash. Channel Islands are a closed ecosystem. Please be sure you are not packing any pests such as plant seeds with you. Pack out any biological trash. Binoculars – A good set of binoculars make it so much easier to see the birds on the cliff of Channel Island. Water bottles – Plan on at least 1 gallon of water per person in your group. Bring reusable water bottles with you to elimiate waste. 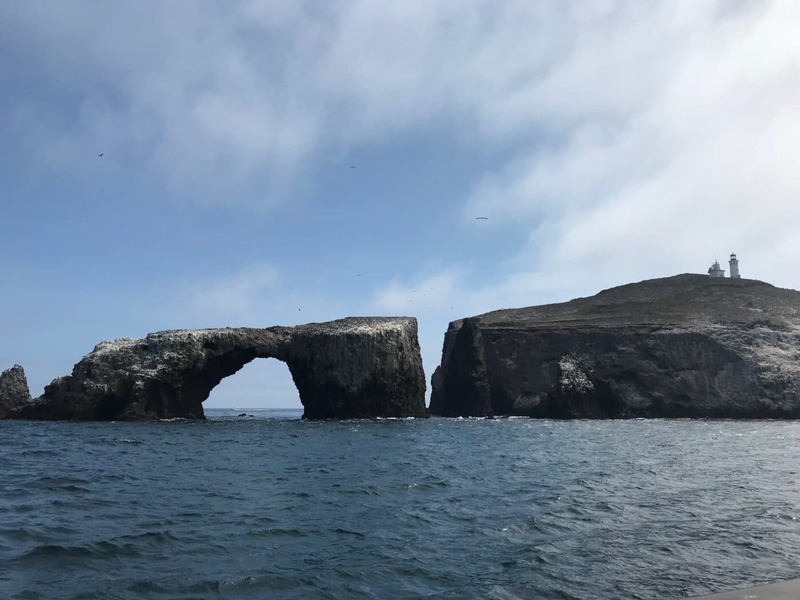 This picturesquely eroded, 40-foot high arch is so distinctive it’s become a symbol for all of Channel Islands National Park. Arch Rock has been created over millions of years by the wind and the sea. Your first viewing of the arch will come as the ferry approaches the landing platform. Often the boat will make a trip around it on your way back to the harbor. If you would like to get a closer view of the Arch Rock, kayak tours are offered by a park concessioner. 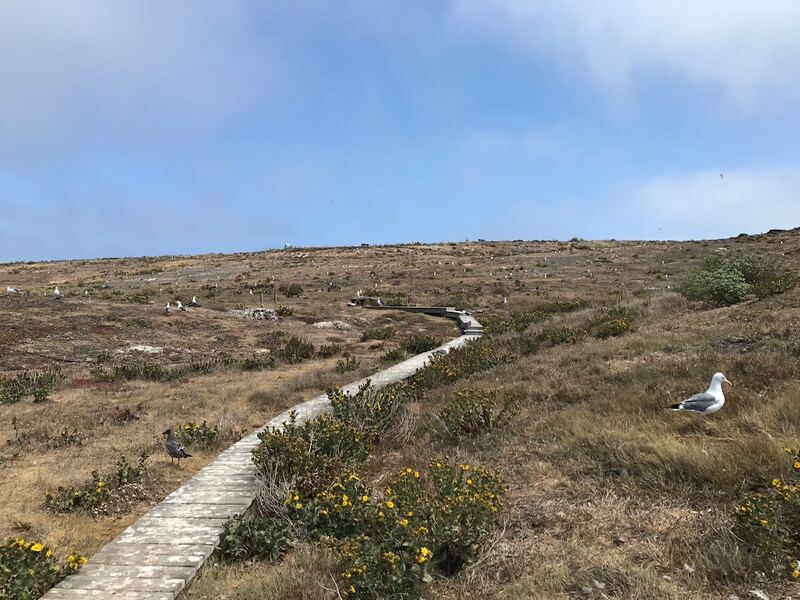 Once you landed at the platform and start climbing the steep stairs to get to the top of the island, take some time to scan along the cliff section opposite the platform for some California brown pelican nests as well as the beautiful kelp forest underwater. You never know what you will see. Plus, it’s a good excuse to take a breather from those stairs too! The Visitor Center on this island is often unmanned. 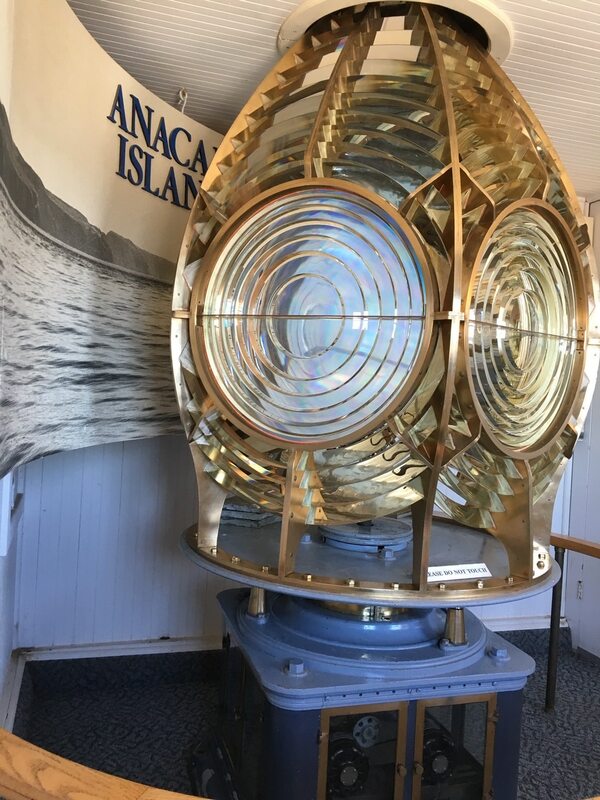 Inside, there’s an exhibition on the island history of the Chumash people, Anacapa lighthouse history and the original lead-crystal Fresnel lens, which served as a beacon to ships until an automated light replaced. If you’re a national park passport stamp collector, don’t forget to bring your passport along for the stamp. Constructed in 1912, it was the last major light station built on the west coast. Now fully automated and unmanned, the lighthouse still operates. As you make your trek towards the lighthouse, take some time to observe and admire the native plants that grow along the trail. 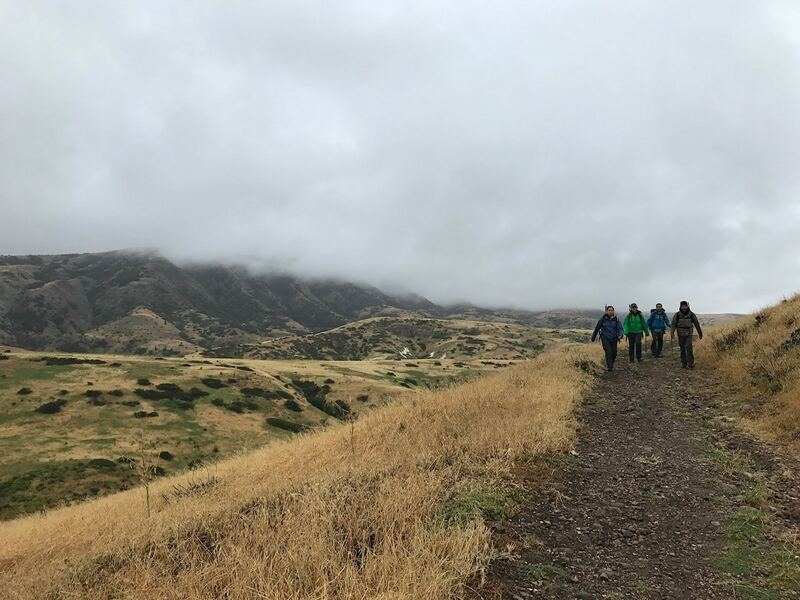 The California Institute Environmental Studies organization along with volunteers from National Park Service have been working on restoration projects to bring back native plants to the island while actively removing non-native species from the area. 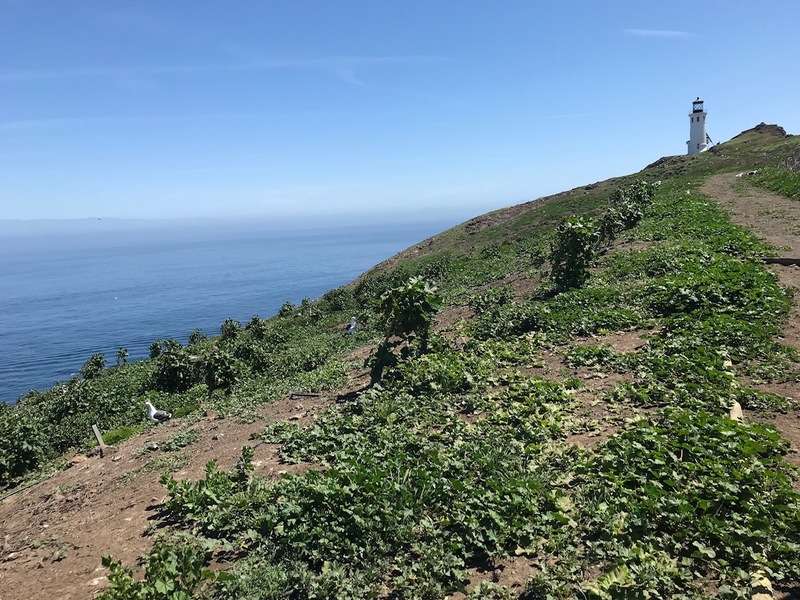 The Anacapa Lighthouse is a 0.5-mile round trip hike from the visitor center. April through July is a busy time on the island in terms of birds traffic. Over 15,000 Western Gulls are found on the Channel Islands. They are the most common seabird in the park. The gulls are more aggressive during the nesting season as they protect their eggs in the nests as well as once the chicks are hatched throughout early summer. Bring earplugs just in case! 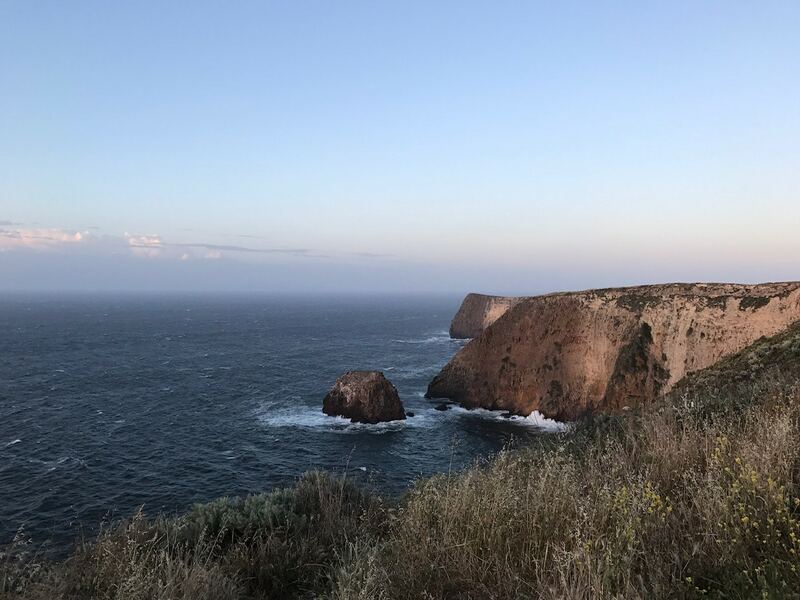 Only the eastern side of Anacapa is open to visitors, the hiking trails on the island are rather short. The main hiking trail is Inspiration Point. 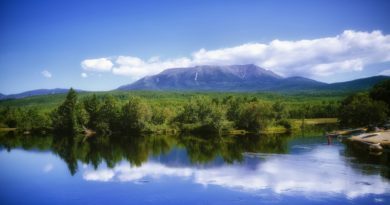 The trail is a 1.5-mile round trip hike from the visitor center. 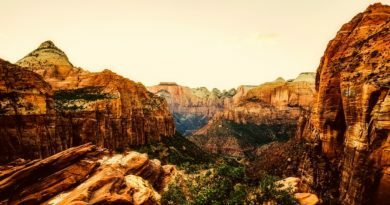 The view along the trail makes the hike a very rewarding experience. The trail system is shaped in figure 8 as you loop around the island. You can include stops at Pinniped Point and Cathedral Cove as well. These stops add 0.5 miles to the hike. Skip the picnic table by the visitor center and head over to the best spot on the island for a lunch with a view. From this point, you can see the view of the rest of Anacapa and the neighboring island, Santa Cruz. Remember to practice Leave No Trace and pack up your lunch leftovers out of the island. 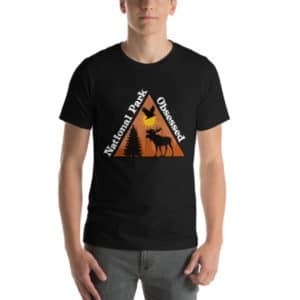 RELATED – How you can protect our National Parks! Assuming you purchased your boat ticket to land at Scorpion Ranch (versus Prisoners Harbor), you’ll be welcomed by the view of slightly sandy and rocky beach. This is a great spot to take in the scenery, and a perfect place to hangout at while you wait for your return trip with Island Packers later in the day. Channel Islands is more than just five islands. The park includes the waters surrounding the islands. Kayaking is also one of the favorite activities while visiting this island. 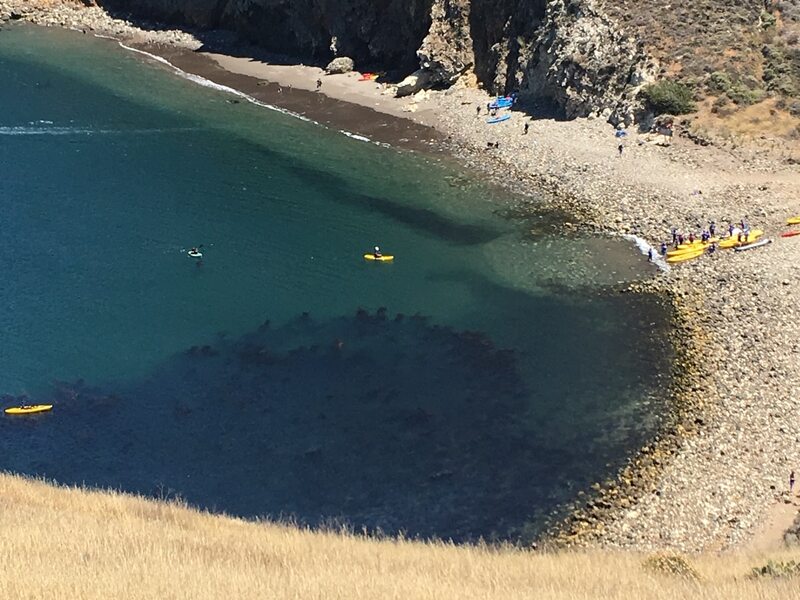 The waters off Santa Cruz Islands are prefect for kayakers of all skill levels. Island Kayaking company has a variation of trip options including guided kayaking to sea caves, painted caves (in the summer) as well as snorkeling rentals. Inside the Visitor Center, there is an exhibition on the ranching activities that took place back in the days and some history on the island natives prior to that. 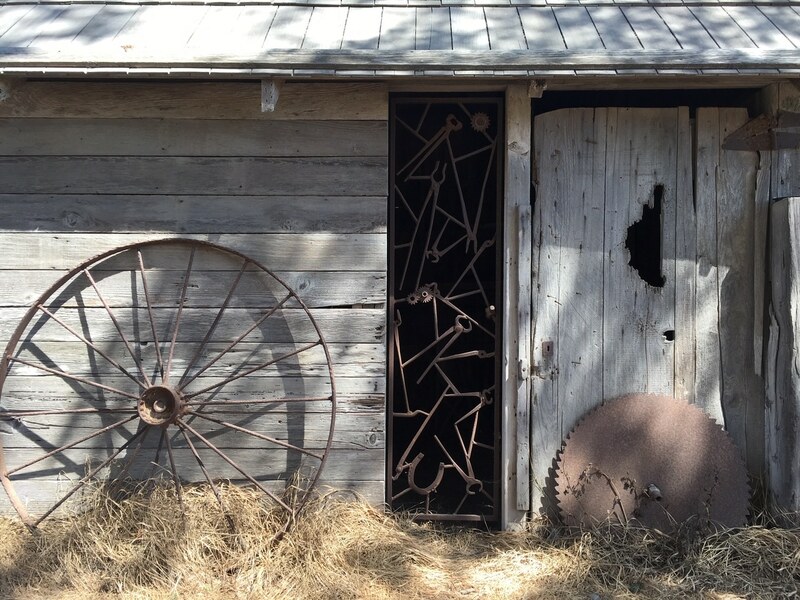 The complex also has exhibitions of ranching equipment outside the Visitor Center to take you back in time and appreciate how much we have progressed since the early days. Similar to Anacapa Island, the Visitor Center also has a passport stamp for your collection. This will increase your likeliness for some island fox encounters. The island fox only lives on some of the Channel Islands, they are found nowhere else on Earth. Although foxes have always existed at low population sizes, four island fox subspecies underwent catastrophic declines in the 1990s. The decline was attributed to predation by golden eagles. 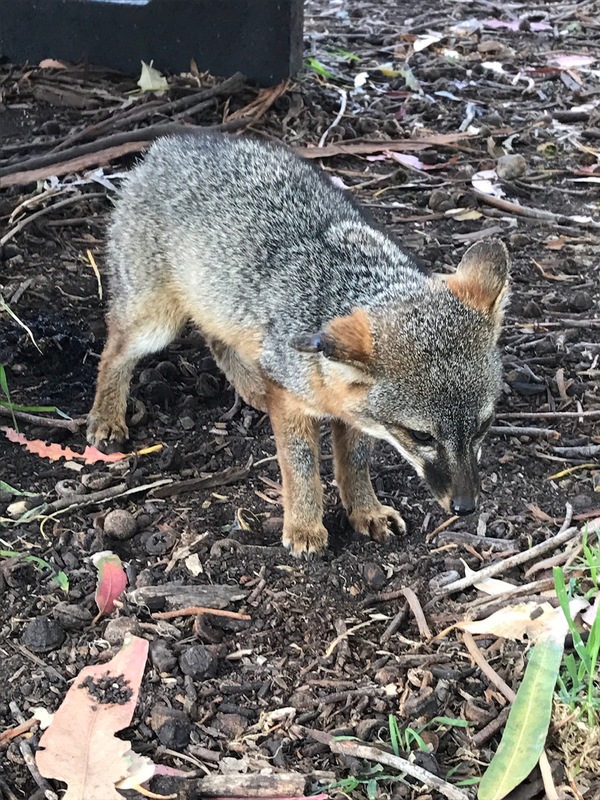 In 1999, Channel Islands National Park began an island fox recovery program that included captive breeding and reintroduction of foxes, removal of resident golden eagles, re-establishment of bald eagles, and removal of non-native ungulates. Today, the population has recovered within the park. From the upper campground, there’s a trail ascending a small hill to hike up along the Scorpion Canyon towards Potato Harbor. The slope is gradual and gives you an opportunity to shelter from the wind as you’re partially hiking inland. Depending on the season and inches of rain received, the scenery could be very green along the trail. At Potato Harbor, you will be treated with a spectacular coastal view. Potato Harbor is a moderately difficult trail and is 5 miles round trip. There are several viewpoints along the trail as you loop your way back towards the Visitor Center, but Cavern Point is a great stop to take in the scenery as you break for lunch. The ever-present western gulls and graceful pelicans often can be sighted soaring along the steep, rugged volcanic cliffs. Cavern Point is about 2 miles from Scorpion Beach. The trail is moderately difficult with a steep climb if hiking counterclockwise. 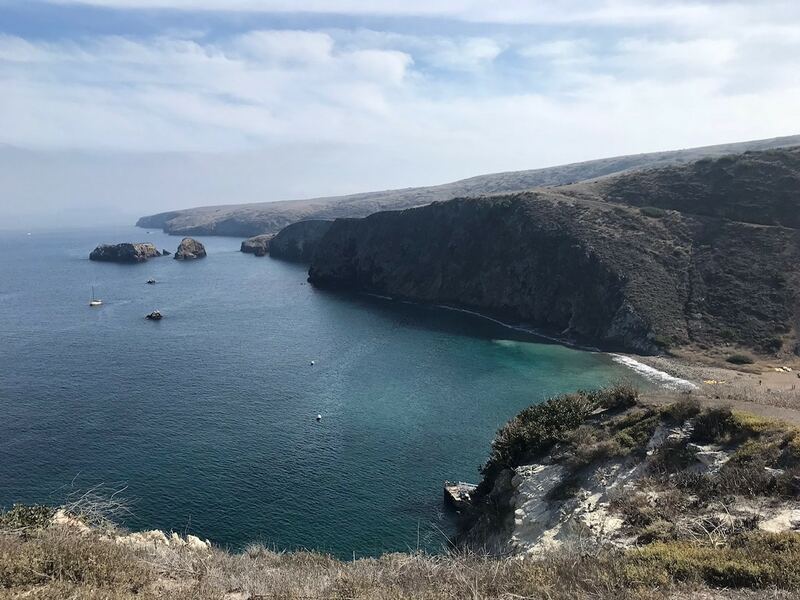 Before descending back to platform level, stop and take in the view of Scorpion Beach from a higher level and try to see if you can view Anacapa Island from this point. You may also spy the kayakers and the kelp forest near the beach area. If you spy the Island Packers boat approaching the landing platform, be sure to hike down so you don’t miss your ride home! What do you want to do in the Channel Islands? 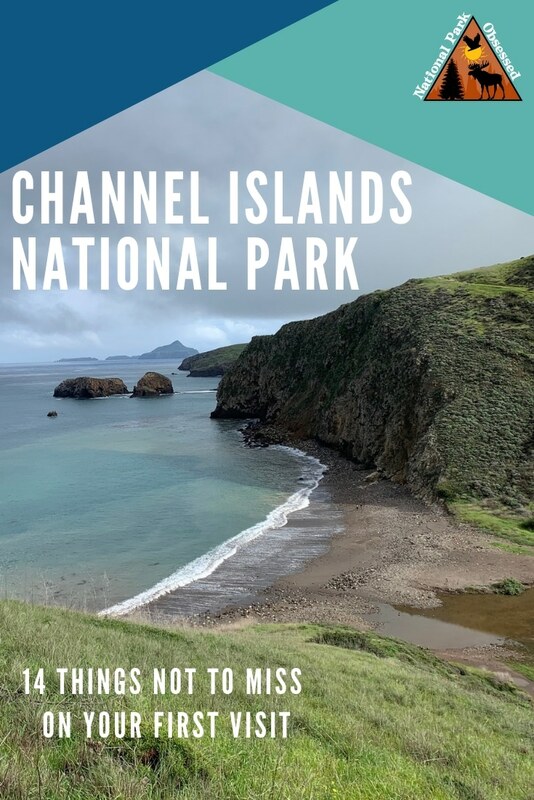 Did I miss anything that should be on the Things Not to Miss on Your First Visit to Channel Islands National Park list? Linda was born and raised in Malaysia, later migrated to the US at the age of 19 and soon fell in love with America’s Best Idea. 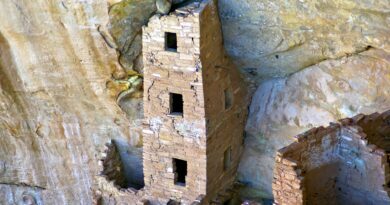 She’s an avid hiker and a national park traveler. To date, she has visited 44 of the 60 national parks in America. 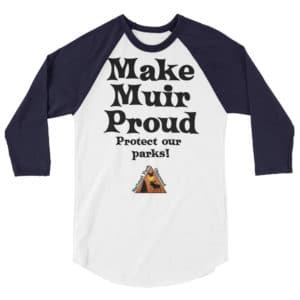 Linda also volunteers her time at the John Muir National Historic Site in Martinez, California as well as serves on board of director for the Channel Islands Park Foundation. One of her life goals is to experience all 60 America’s National parks before she retires. Follow her journey through Instagram at @thebucketlisttraveler! 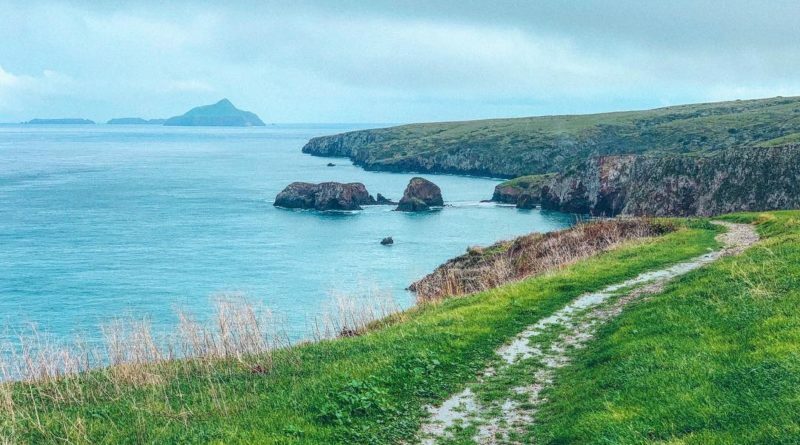 Love this post – I’ve never really thought about heading to the Channel Islands, but your post has got me thinking about a visit. Love the rugged nature shots. Whoa how awesome Linda. I had never heard of these islands; looks a little bit different from the region in general. Noted for my travel list of places I need to experience.